Rajasthan Ratna Award 2013: Government awarded 7 persons for Rajasthan Ratna Award 2013 today Jawahar Kala Kendra, Jaipur. Rajasthan Ratna is the Rajasthan's highest civilian award, for performance of highest order in any field of human endeavor. Founder of Bhagwan Mahaveer Viklang Sahayata Samiti Dr D R Mehta (social service), Jasdev Singh (commentary), Pandit Ramnarayan (Sarangi player), late Nagendra Singh (law), late Kailash Sankhla (environment protection), late Hasrat Jaipuri (Art and Culture) and late Gavri Devi (Maand singer) have been selected for the award. 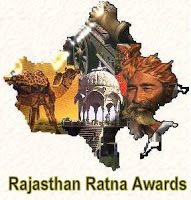 Rajasthan Government started Rajasthan Ratna Award from year 2013. 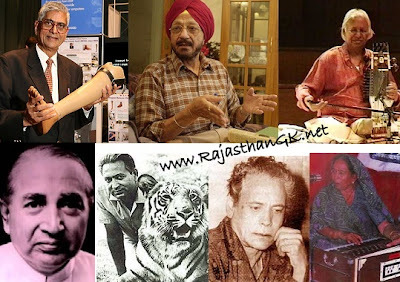 You can also check Rajasthan Ratna Award 2012 Winners. 1. Dr D R Mehta (social service): Dr. D R Mehta, founder and chief patron of the organization that popularized the Jaipur Foot gets Rajasthan Ratna Awards 2013. D.R. Mehta (born June 25, 1937) is a former chairman of Securities and Exchange Board of India. He is a founder and chief patron of Bhagwan Mahaveer Viklang Sahayata Samiti (BMVSS), the world's largest organization for the handicapped in terms of free fitment of artificial limbs/calipers etc. 2. Jasdev Singh (commentary): Jasdev Singh is an Indian sports commentator. He was awarded Padma Shri in 1985 and Padma Bhushan in 2008. He has also been official commentator on Independence Day, and Republic Day parade broadcasts since 1963 for state run media, Doordarshan and also All India Radio. 3. Pandit Ramnarayan (Sarangi player): Pandit Ram Narayan, is an Indian musician who popularised the bowed instrument sarangi as a solo concert instrument in Hindustani classical music and became the first internationally successful sarangi player. Narayan was born in Udaipur and learned to play the sarangi at an early age. 4. Nagendra Singh (law): He served on the United Nations International Law Commission from 1967 to 1972. He was appointed representative in UNO assembly in 1966, 1969, 1975. He was also elected secretary in international bar association, and served as Chief Election Commissioner of India. He was a recipient of the Padma Vibhushan from the Government of India in 1973. 5. Kailash Sankhla (environment protection): Kailash Sankhala (1925–1994) was a renowned naturalist and conservationist of India. He was the director of Delhi Zoological Park and Chief Wildlife Warden of Rajasthan. Born on 30 January 1925 he is best known for his work in preserving tigers. 6. Hasrat Jaipuri (Art and Culture): Hasrat Jaipuri (April 15, 1922 – September 17, 1999) was a Hindi and Urdu poet and film lyricist in Hindi films. Jaipuri was born in Jaipur, where he studied English till medium level, and then acquired his taalim in Urdu and Persian from his paternal grandfather, Fida Husain. 7. Gavri Devi (Maand singer): Gavri Devi (14th April1920-29th June1988) was one of the most successful, disserving singer of mand style of singing from Rajasthan. When India organised the Indian Festival in Moscow (Russia) she gave her special performance their.